The LEWA Group has a new-look website that is clearer, more informative and more appealing. Visitors of www.lewa.com are offered a completely renewed structure with detailed product information, services and innovative tools. A modern user interface coupled with fresh and elaborate contents invites internet users to discover LEWA. Creating a clear and well-organised site was the highest priority in the remodelling process. Technical figures, data and facts have been compacted; texts have been reduced to contain only crucial information. Thus the site provides many details at a single glance. Furthermore numerous animations and illustrations visualise the functioning of LEWA’s pumps and systems. Another fundamental revision concerns the website’s structure. Several areas are linked intelligently and can be accessed from different directions. The thematic focus lies on providing information about pumps, systems, technologies, applications and industries. Thus, visitors are always able to find requested information – no matter where they started their search. A good overview is presented by a portal page summarising all topics. The simple tab structure used on the main pages makes details quickly accessible. Visitors will find entries concerning areas of application, specific solutions and product options. In addition to that, brochures can be downloaded from the product pages and references prove LEWA’s experience and competence. Navigating through the site is facilitated by the new, improved search function. It enables users of www.lewa.com to look up certain data or downloads by entering their request directly into a search box. 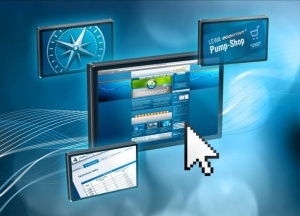 The pump navigator provides the opportunity to pre-select a pump series. Prospective buyers can type in their specifications into a search mask. In accordance with these, a pump series will be recommended. Subsequently, the data can be forwarded to one of the assigned LEWA experts and serve as a basis for consultation and sales talks. For the first time pumps can be ordered online. 160 pre-defined models of the LEWA ecosmart are available in the pump shop. The suitable version is determined by the customer’s requirements. This is not only convenient but also money and time saving. Online buyers of ecosmart models can save up to 30% off the regular price. And they also benefit from shorter shipping times. In order to keep Lewa’s global expert network – consisting of 16 subsidiary companies and over 90 representatives in the world – up-to-date, the area of the LEWA Academy has been expanded. Already available content has been complemented with an e-learning portal for registered users.